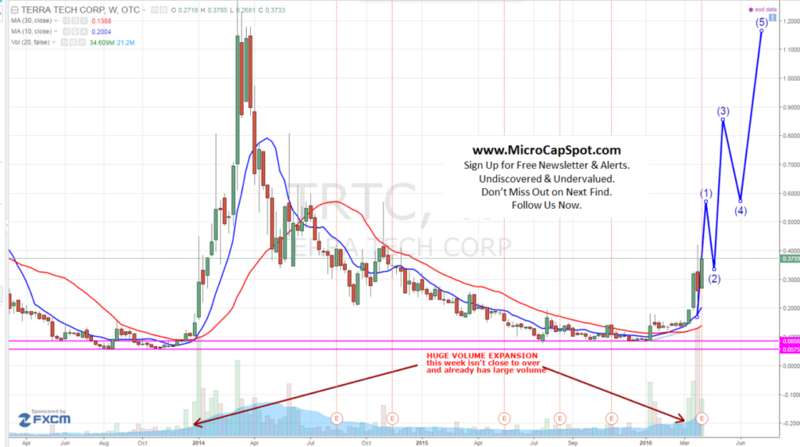 Terra Tech Corp (OTCMKTS:TRTC) released breaking news stating that the City of Las Vegas has granted TRTC approval and permits to operate a medical marijuana dispensary in the city. It is still waiting for its final certificate from the State of Nevada which is expected to be issued once inspections are completed. The dispensary is due for its final inspections and TRTC expects to receive is business license from Las Vegas very soon. The grand opening date for its first dispensary in Las Vegas is set for April 20, 2016. In a secret tweet, the company announced a sneak peek on exciting R&D projects. Gains since first feature are 190% and Gains since second feature are 120%. Make sure not to miss next alert. TRTC has plenty of room to run from current levels. Terra Tech Corp (OTCMKTS:TRTC) recently announced that it will be opening a new dispensary for marijuana. The dispensary that was opened in Nevada is a 3,900 square foot facility. Through the dispensary TRTC will sell premium medical cannabis, including flowers, shatters, waxes and oils, among other high-quality cannabis products from a range of reputable providers of superior grade medical cannabis. TRTC is Chief Executive is a powerhouse in the investment world. It is run by Derek Peterson who is a former Vice President at Morgan Stanley. He left Wall Street because he saw a huge opportunity in medical marijuana. His vision is setting up growing facilities in various states to grow herbs such as basil and thyme with plans to switch to Marijuana production as state laws permit. Terra Tech Corp (OTCMKTS:TRTC) is from a technical chart perspective is breakout out in a big way. The share price broke out to new highs and continues to show a powerful technical formation. From its current levels it could easily advance to $0.60, a 50% gain from current levels. In the long-term, depending on momentum and its new developments, it could reach as high as $1.00+ in no time. The stock is breaking out of a long base and has been forming a bowl shape pattern. The stock is just beginning to form the upward slopping portion of the bowl and the stock has broken out above its 10 and 30 weekly moving average on a massive spike in volume. TRTC is beginning to show a stair-step pattern which is an extremely powerful technical pattern where the stock advances on large volume than consolidates for a few weeks and makes another powerful advance surpassing its prior high and consolidating again to repeat the pattern. Take a look at the chart below for potential price movement. MicrocapSpot has covered TRTC and it in our previous post, we stated that TRTC was primed for more gains. Since then the stock has gained over 20%. TRTC was initially incorporated as Private Secretary, Inc. on July 22, 2008 in the State of Nevada. It originally had planned to develop a software program that would allow for automatic call processing through VoIP technology. On January 27, 2012, the Company filed an amendment to its Articles of Incorporation changing its name to Terra Tech Corp and a new pot stock was born. TRTC operates as a holding company. The three wholly owned subsidiaries include GrowOp Technology Ltd., Edible Garden Corp. and IVXX, LLC. TRTC also has ownership interests in MediFarm, MediFarm I and MediFarm II. Through GrowOp it designs, markets and sells hydroponic equipment and indoor agriculture. Edible Garden subsidy acts as a retail seller of locally grown hydroponic produce. Edible Garden Corp. distributes hydroponic produce across the Northeast, Midwest and Florida. Edible Garden supplies local and sustainable products grown from hydroponics to major grocery stores including Shoprite, Kroger, Walmart, and others. We will be updating on TRTC when more details emerge so make sure you are subscribed to Microcapspot so you know what’s going on with TRTC. TRTC is currently trading at a $54 million market valuation. The share price has advanced significantly since we featured the company and called it a major player and turnaround story. It has almost tripled since our first post. TRTC will likely continue its turnaround in a meaningful way as it rises from the ashes. Stay tuned as we will be updating subscribers daily. Disclosure: we hold no position in TRTC either long or short at the publication of this article and we have not been compensated for this article.